The school holidays have come to an end. Sidney, my scrumptious 5-year old, starts school for the first time tomorrow – his little uniform is sitting on the couch and it makes me well up just looking at it. I’m back at work tomorrow too, so cooking for me at the moment is all about stocking the freezer with easy bits and pieces for quick dinners. I know there are probably one billion pesto recipes floating around in cyberspace, but mine is pretty ace, even if I do say so myself. The walnuts and roasted garlic make it extra tasty, and it’s full of vitamins as there is a load of spinach mooshed up in it too. Pesto freezes really well, and also keeps excellently in the fridge for up to 1 week. There is no need to add a layer of oil as some recommend. This pesto retains its vibrant green colour due to the splash of lemon juice. I prefer to add the parmesan to the pasta later as pesto keeps better without it. My boys absolutely love pesto pasta, and it’s easy to add a few vegies to the pasta cooking water, such as peas; or even tiny broccoli florets. This recipe makes 3 generous serves of pesto, so you can set some aside for two different pesto pizzas later in the week; one for mature tastebuds with roasted cauliflower and chilli; and a kid-friendly version with bocconcini and cherry tomatoes, which we like to call ‘the fancy margherita’. My wholemeal (wholewheat) pizza dough recipe is here. I make this dough often, and the pizza bases freeze well (see tips in the recipe). PS. Do you like my ‘tablecloth’? It’s actually wallpaper. I’m extremely excited as I found a huge book of vintage wallpaper swatches in my local oppie last week. Be prepared for some kooky table covers in the coming weeks! Preheat oven to 150°C (300ºF). Wrap unpeeled garlic cloves in foil and roast for 40 minutes. Set aside. Whizz the walnuts with a stick blender (in batches) or food processor until finely chopped – take care not to blend them for too long or you’ll end up with a paste. They should retain some texture. Set aside. Squeeze the roasted garlic cloves from their skins and add to the remaining pesto ingredients. Blend in batches, with a couple of tablespoons oil added each time. Place into a large bowl as you go. Add the crushed walnuts and mix thoroughly. ♦ Divide pesto into 3 portions of approximately 150g (5 oz); or 2 portions of 150g (5 oz) and 2 half portions of 75g (2½ oz). You’ll need 1 full portion of pesto for tonight’s spaghetti. The rest can be frozen – see tips below recipe. Cook spaghetti in boiling water until al dente. Add peas to the same pot for the last 2 minutes cooking time (if using fresh peas, add to the pot for the last 4 minutes). Drain spaghetti and peas, reserving ¼ cup of the cooking water, and place into a large bowl. ♦ Add 1 full portion of spinach, walnut and roasted garlic pesto, parmesan and reserved cooking water; and toss together. Season to taste. Serve immediately, scattered with extra shaved parmesan. Pesto can be stored in a tightly-sealed container in the fridge for up to 1 week, or frozen for up to 3 months. Thaw overnight in the fridge. 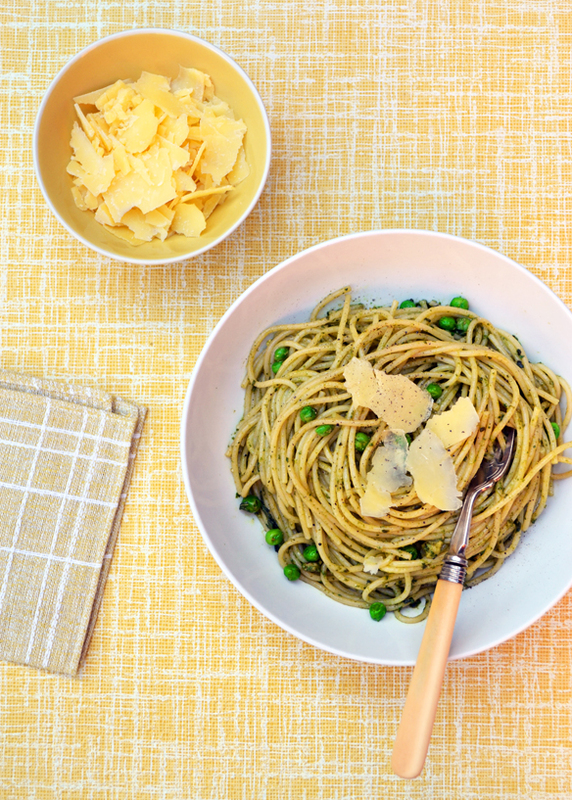 When using pesto with pasta, add parmesan just before serving. Pesto keeps better without the parmesan added. Smaller pesto portions (for sandwiches, salad dressings and scrambled eggs) can be frozen in ice cube trays. Transfer the frozen cubes to a plastic container, and pop back in the freezer. Both the garlic cloves for the pesto and the cauliflower for the pizza can be roasted up to 2 days in advance. They can be baked alongside other vegetables and stored in a container in the fridge until required. The basil and spinach leaves should be very well dried after washing so your pesto isn’t too watery. You can use a salad spinner, or pat them dry with a clean tea towel. Don’t worry about bruising the leaves – you’ll be pulverising them anyway! This recipe can be varied by replacing the walnuts with cashews, pine nuts or pistachio nuts. Baby tip: You can make pesto for older babies at the same time, by blending a handful of spinach leaves (about 60g/2 oz), 1 large basil leaf and a small undrained 95g (3 oz) can of low-salt tuna in springwater (or a small cooked fish fillet and a splash of water). Freeze in ice cube trays and defrost as needed. Serve with couscous (blended if required). Pizza 1: Bocconcini, pesto and cherry tomato (‘fancy margherita’). Preheat oven to 250°C (480ºF). Place two pizza trays into the hot oven to warm up, for at least 10 minutes. This is an important step for crispy-based pizzas. If using home-made wholemeal (wholewheat) pizza dough, sprinkle flour on a sheet of baking paper. Roll out and press each dough ball into a rectangle. Make the dough as thin as you can, as it will puff up a bit in the oven. Spread each pizza base with home-made pizza sauce, or tomato passata. ♦ Drizzle each with spinach, walnut and roasted garlic pesto. For pizza 1: Top prepared pizza base with bocconcini and cherry tomatoes. For pizza 2: Blanch the cauliflower florets in a pot of boiling water, covered, for 2–3 minutes. Drain. Dry thoroughly in a clean tea towel. Place into a bowl and toss with the olive oil until well-coated. Arrange the florets on a baking tray lined with baking paper (you can use one of the pizza trays). Sprinkle with salt. Roast in the preheated oven for 10 minutes. Top prepared pizza base with bocconcini halves, followed by roast cauliflower, and chilli flakes. Carefully slide pizzas and baking paper onto pre-heated pizza trays and bake for 10–12 minutes until bubbling. Cook separately if they don’t fit side by side. You may need less cooking time if using pre-cooked store-bought pizza bases. Remove from oven. Scatter pizza 1 with fresh basil. Serve pizzas immediately. Bocconcini are small, white mozzarella cheese balls, packaged in water. Cherry bocconcini are very small, the size of a cherry strangely enough! They’re available at most large supermarkets and delicatessens. Replace with sliced mozzarella if unavailable. Leftover pizza is of course excellent for lunch the next day! This entry was posted in NUTS/SEEDS & GRAINS, PIES & PIZZA, VEGETARIAN and tagged freeze pesto, pesto pizza, roast cauliflower pizza, spinach pesto, walnut pesto by Saskia (1=2). Bookmark the permalink. Well Sas- another receipe saw the light of day in my kitchen! I fiollow your receipes in some strange order that has something to do with what I feel like cooking,. Every week I work out my weekly menu and get onto your blog to try out a new receipe and leftover. Last week it was the pesto which was great. I actually love having it in the freezer and bringing it out for mini pizza for my daughter (Harriet) which I have already done. As it is still on the hot side (yay! )- this week will see me trying out the amaranth salad- I am keen to understand the alternate grains a little better- being a little ancient myself I am sure we will get on just fine! ACE Fran. Thanks so much. Really rapt you tried the pesto. I nearly always have it in the freezer. Starting to panic that basil season is nearly over. Will have to make a double batch to freeze for Winter! Look forward to your thoughts on the amaranth salad. We just love it. Pingback: Coriander Pesto | A Recipe for Pasta Sauce | Craft it. Bake it. Ace. Hope you enjoy it! I use a Nikon D3100 + 18-55mm lens. It’s not particularly fancy, but I LOVE it. The best purchase I made was a small light tent set-up (from ebay) that lets me shoot indoors. I love photographing food outdoors, but I was finding it impossible to shoot early enough in Winter! Great you made the pesto – thanks so much for the pingback! The tent setup I bought was titled a ‘Photo studio light tent’, which came with lights and a boom arm. There are lots of sets on Ebay (none listed from the seller I bought mine from though). They’re all pretty similar-looking. My tent is medium-sized, about 70cm square, and was around $AU100. SO handy – I love it. Ha. Thank you! I LOVE pizza for breakfast – not a terrible idea at all. I love pesto and I love that you add spinach in it. 🙂 Very beautiful pictures. Best of luck to your little one. I’m sure he’ll do really well at school. Thanks Amy. The little one LOVES school so I’m a happy camper now. oh bugger, no I’m ridiculously hungry… they look awesome! Lucky you, being able to buy proper ready-made pizza dough! oh pesto, I love it! I must confess that I didn’t know about non-basil pesto until last year! Now I love to use chard or spinach. Yours sounds divine! Chard sounds like a great idea. Love sneaky ways of getting more vegies into my boys. I love pesto. Pesto pasta is my biggest weakness but im also a huge sucker for pesto pizza and pesto as a dip. Love both of these recipe! Forgot about pesto as a dip! Yum. Thanks Ali. Both boys are loving school. My 5-year old is SO proud of his uniform. Very cute. Thanks CCU. It did go down delightfully. Oh my, those pizzas look divine! We’re on a real home made pizza kick at the moment … so easy for me to whip up after work … I will definitely be bookmarking your pesto recipe to try. Fantastic! Yes, we love a quick whip-up-after-work dinner here too. yes! 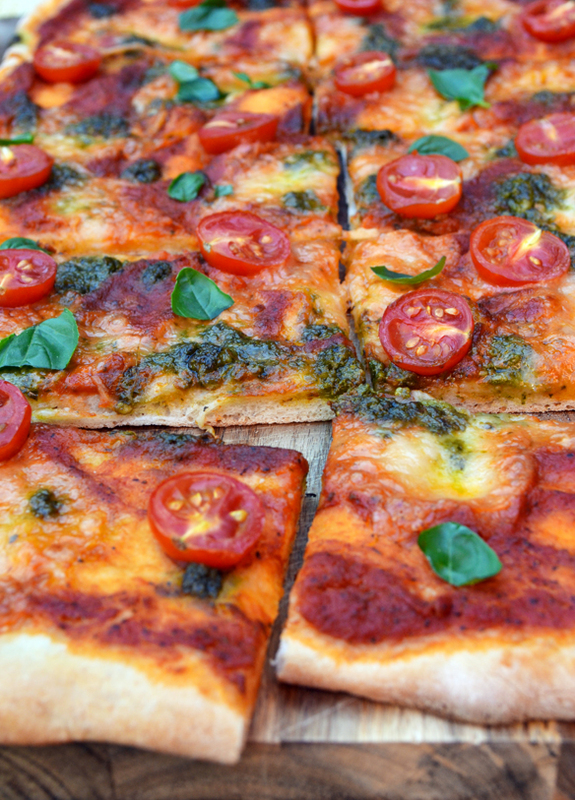 a pinworthy margherita pizza…would be good with a margarita too! I especially love the sound of the roasted cauliflower, pesto & chili adaption! Yummmmm! Thanks Sophie. The cauli/chilli combo was great, I must admit! Husband said it was restaurant-quality, which is boastful of me to admit, but I was pretty chuffed. PS. I love yellow too. That pasta dish looks so vibrant and inviting to dig in! Thank you. We do love it. Serving it up for dinner again tonight actually. I have 3 enormous pots of basil ready for plucking, so I need to get through it all! Oh goodness, your pizza is so colorful and looks so delicious. I love all the recipes. I love pesto. I make a spinach pea pesto that is pretty popular around here! 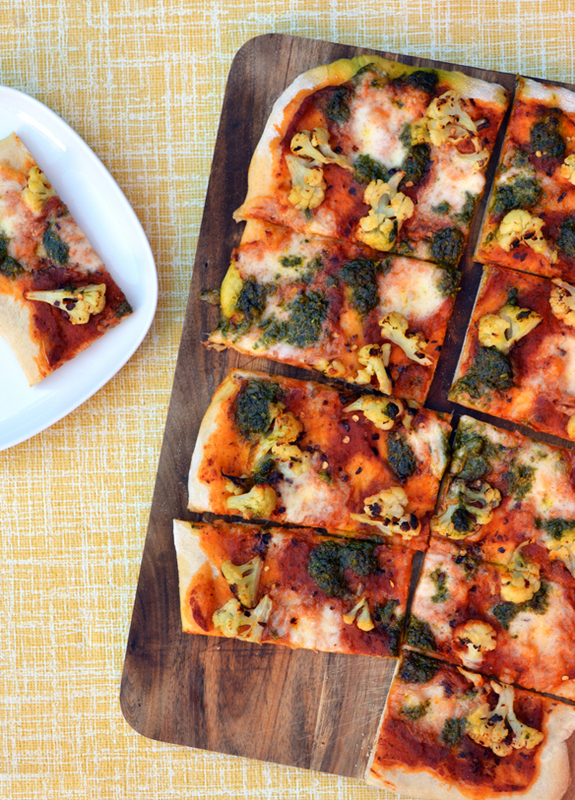 I love your cauliflower pesto with the addition of the red chili flakes…what a wonderful addition!! I need to try that next time! Thank you! Your spinach pea pesto sounds great – do you blend the peas in with the other ingredients?